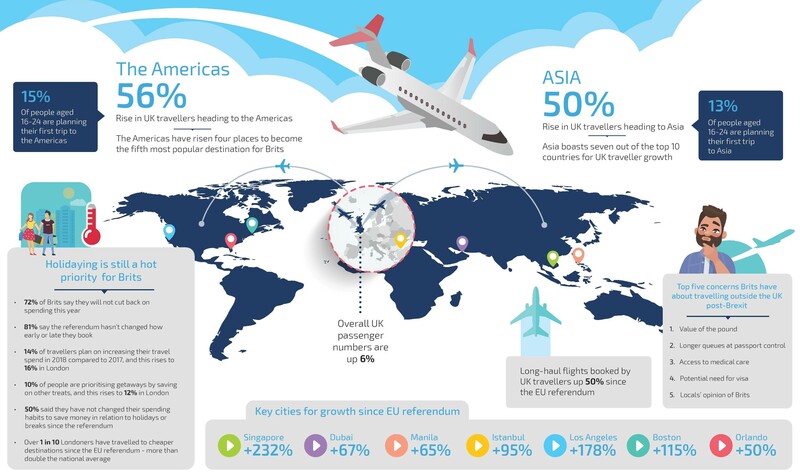 New insights released today by online travel company eDreams ODIGEO has revealed that UK travellers are heading further afield since the EU Referendum, with the company’s data showing a 50% increase in long-haul passenger volumes. eDreams ODIGEO’s research and insights team have analysed travel industry data to identify trends since the EU Referendum, aka Brexit. It reveals a positive picture for UK outbound travel, with passenger numbers to all destinations up 6%, buoyed by an increase in passengers travelling to long-haul destinations, including the Americas (+56%) and Asia (+50%). Asia now boasts seven out of the top 10 global countries for UK traveller growth since the EU Referendum vote. Singapore has rocketed in popularity with Brits, seeing a 232% increase in passengers, in line with a record-breaking year in 2017 for passenger volumes at the city’s Changi Airport. Other Asian destinations which saw considerable growth during the period include Manila (+65%), Dubai (+67%), and Istanbul (+95%). During the same period, the US has risen four places to become the fifth most popular destination for British travellers. Los Angeles led the list of cities for highest passenger growth with a 178% rise in visiting Brits, while Boston (+115%) and Orlando (+50%) also ranked in the top 10 for growth. The trend is linked to the recent rise of low-cost airlines offering long-haul flights, such as Norwegian Air, which launched 20 new transatlantic and Asian routes between June–September 2017. The survey also suggests the growth trends towards Asian and American destinations could be set to continue, thanks mainly to young travellers looking to explore long-haul destinations for the first time. Around one in 10 (13%) people aged 16-24 are currently making plans to visit Asia for the first time, whilst 15% are planning an inaugural trip to the US. Robert McNamara, head of UK and group external affairs at eDreams ODIGEO, said: “The pound’s fall in value against the Euro, combined with an increase in low-cost long-haul flights, has pushed up UK demand for long-haul travel since the EU referendum in 2016. “This broadening of holiday horizons is encouraging for the travel industry. Time abroad remains precious and a top priority – with most Brits intending to keep holiday spending the same, even if it means cutting back on other areas.